Question: How can I get copies of all the expenses involved in my filings - like is presented at the time of filing but which may have gotten mislaid? 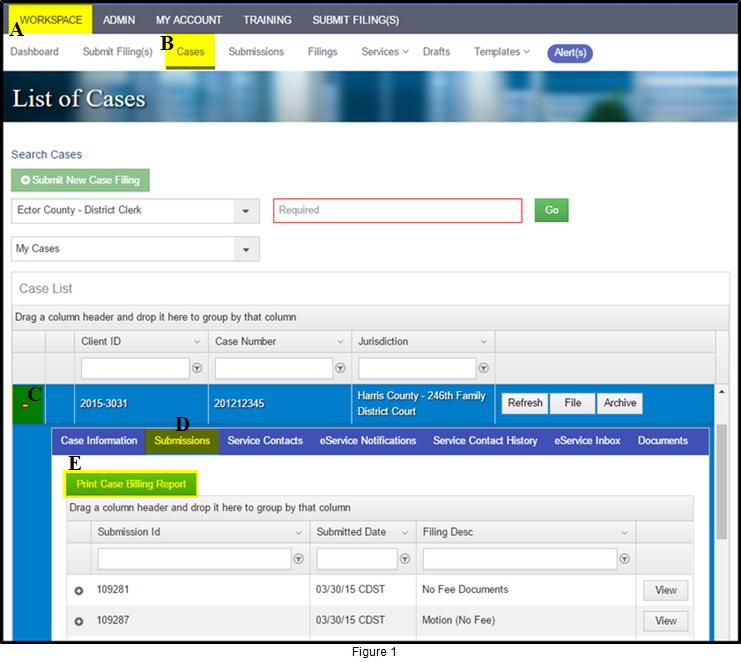 From the WorkSpace (Figure 1, A), click the Cases button (Figure 1, B) to arrive on the List of Cases page. Find the case for which you want to generate the billing report and click the + sign in the far left column (Figure 1, C). The case tabs open beneath the case. Click the Submissions tab (Figure 1, D). Click the green Print Case Billing Report button (Figure 1, E). FileTime automatically generates the report for you (Figure 2). Click the green Export to PDF button to create a PDF version of the report.